It was with high confidence that Whalers CC arrived for their fourth game of the season. It had been anticipated that Elthorne would provide our sternest test to date but our previous form gave justifiable cialis generique cause for hope. However, as Skip Al Dickenson lost the toss for the first time, perhaps we should have seen the bad omens. But it was beautiful weather, a well located ground and the bar was close – who cared for omens? batsmen little chance to impose themselves. The runs were slow in coming and the wicket was making hard for the batsmen. A couple of early wickets were justly deserved and the incoming batsmen failed to make too much of an impression in terms of run rate. However, as the innings progressed the Whalers paid a heavy price for some very lapse catching which saw in excess of 6 chances being spilled. The second half of the innings saw the introduction of a more aggressive stance from Elthorne and runs were taken off wayward balls. The Umpires however, were outrageously strict with their wides, which went someway to helping the opposition on. Osgood was introduced into the attack for the final phase, a shrewd piece of captaincy that paid immediate dividends as his first ball seared through the defence of the batsmen. However, some strong hitting from Elthorne and poor catching took their score to a defendable total – 167 – but one that we felt was very gettable. The Whalers innings started off in the right manner with 30 taken off the first six overs, mainly thanks to elegant and robust hitting from Osbourn. Although we lost our first three wickets in the space of nine runs, it far from panic stations as the Whalers boosts an impressive depth in batting and Elthorne’s bowling was unremarkable if quite persistent. 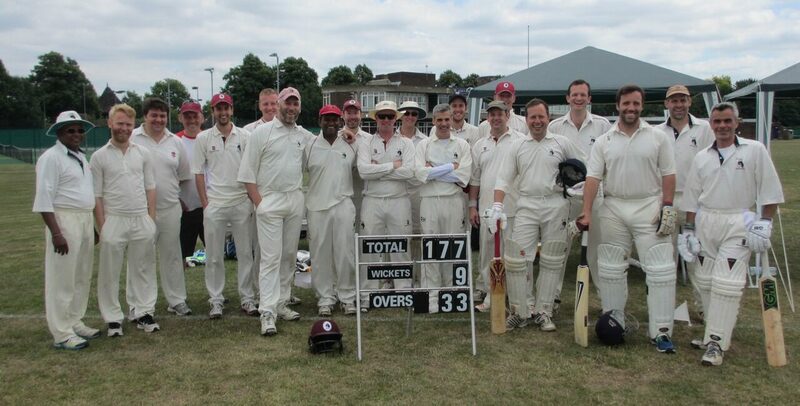 Al Dickenson and Osbourn steadied the ship and took us up to 70 – less than a 100 remained. When Al was joined by Ian Gibbins in the middle the good work continued with some good running (although some may say the running was foolhard). A very defensive field made boundaries hard to come by and so quick singles were the order of the day. Together they took the score past 100. Ian’s departure precipitated another mini collapse with Al being out to a hideous ball (which he should have planted over midwicket) and Ollie Bayne failing to trouble the scorers. Chris Sherrat, making his debut, started well but fell to a catch behind. At 116-8, it was looking tough. However, a fine late rally by Willians and Osgood took the mighty Whalers to within sight of victory. Courtesy of good running and stroke play by the ninth pair, Elthorne looked (and behaved) defeated with only 18 needed off the final four overs.. An unfortunate swipe by Osgood gave the wicketkeeper an easy enough chance and put the pressure on the last pair. Williams thumped the next ball down long on’s throat and the Whalers were at last defeated. It left a bitter taste – it all could have been so different. But we retired to the bar to lay into the drinks and the sadness of the moment was soon drowned in plenty of lager.